It's been a long time since I've seen anything so committed to an ideal of going off the grid and living on the land. 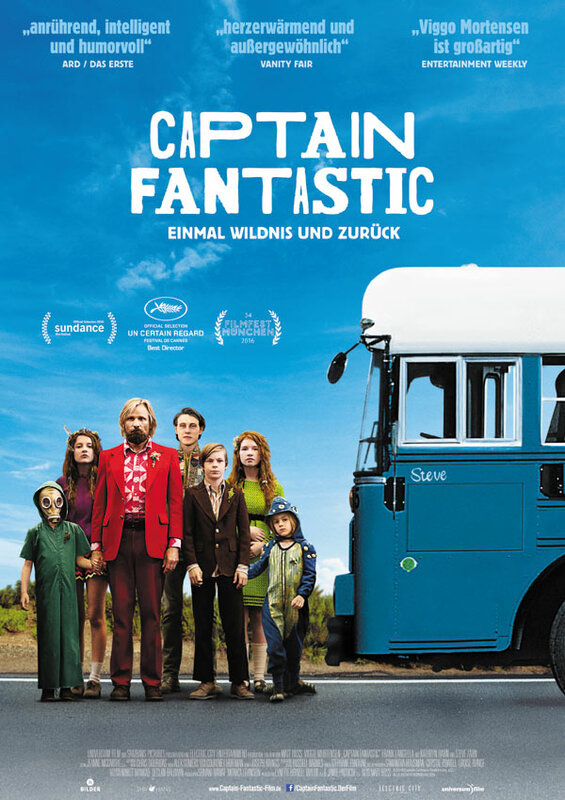 Viggo Mortensen has a bravura role here as Ben, who lives with his six children in a rain forest in the Pacific Northwest, home schooling them in book knowledge and survival skills both. The plot turns on the suicide of his wife and the mother of their children. We only see her in glimpses in flashbacks. Her ultra-conventional family—for that matter, his family too—suspect something about their wild woods adventure lifestyle led to her end, while Ben is certain it was untreated mental illness. Maybe that's the same difference? Anyway, the plot turns specifically on the attempt of Ben and the kids to recover her body and dispose of it as she said she wanted and specified in her will. This unfortunately leads to highly charged confrontations between hippies and straights that play out predictably for the most part. More than once I thought I might be looking at Billy Jack again. A few plot points are so contrived I'm surprised they didn't just make them musical numbers. It is often smug and glib about the family's strange lifestyle—they celebrate Noam Chomsky Day instead of Christmas, and in one scene Ben is wearing a Jesse Jackson '88 t-shirt, among other clonking points that arrive on a regular basis. Yet there's no denying something about it is effective too. I hope it's not just my weakness for seeing people take it to The Man, though I admit that probably makes me more indulgent. At the very least, it raises issues that deserve an airing (raises them all too conveniently, I know). Hippies had a good point 50 years ago about living sustainably on this planet, with respect and justice for all, and they still do today, in an era that more and more feels like formal giving up and partying to the dawn, until the shitstorm comes down that we all think might be coming. 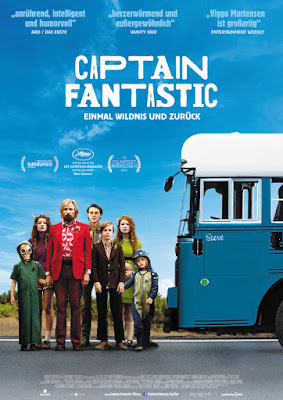 After Mortensen, Frank Langella (Frost/Nixon, Robot & Frank) gets top billing in Captain Fantastic. He's got a great performance too as Ben's father-in-law and a certain embodiment of The Man. Otherwise, be prepared for rampant wincing, impulses to cheer, and a few times when the waterworks might go. Sounds like a good old-fashioned time at the movies, but actually it's more kind of a strange one. Anyway, it motivated me to add The Emerald Forest to my Netflix queue—I remember liking it more than most people, and more than this. Read story by Gina Berriault online. Gina Berriault's story did not impress me much, though it has an arresting last image and lines. Published in 1960, its themes and preoccupations are done better elsewhere, and more generally done to death already. In fairness, this might have felt more groundbreaking, or original, in 1960. An impoverished father is trying to eke out sustenance and raise his son, who is the first-person narrator of this very short story. Early in the story the father snaps, assaults his girlfriend (offstage), and is subsequently hauled off to a mental hospital. Yes, a mental hospital. This suggests he is insane, which means the story could go anywhere. Fortunately, it settles on making him depressed and pathetic. That's still not much but it could have been worse. The story is old enough that I suspect these details are intended to be shocking and dramatic. But they are not, particularly, and a lack of concrete specificity about the events, or anything of interest beyond that they happened, makes the story come up a little short for me. I did find others on the internet praising Berriault's ability to write the first-person narration of a man, and though I've seen worse (usually when men attempt to write as women) I wasn't convinced by it. The dynamics of the father-son relationship seemed cautiously correct, emphasis on caution over correctness, which might explain the lack of detail—perhaps too risky for credibility to go there except in vague ways. I've come to my suspicions of mental illness in fiction by degrees. For a good deal of the 20th century, following Freud's big splash, it was reasonably useful. It felt modern, with its intimations of science and bureaucracy. And we know people do go crazy, whatever exactly that means, and it's dramatic to live through for everyone involved. Fitzgerald, Plath, and Salinger, among many others, have used it more or less to good effect. But at some point—I want to blame the various changes in the concept and treatment of mental illness from the '70s and '80s—it became more rather than less of a rote device. 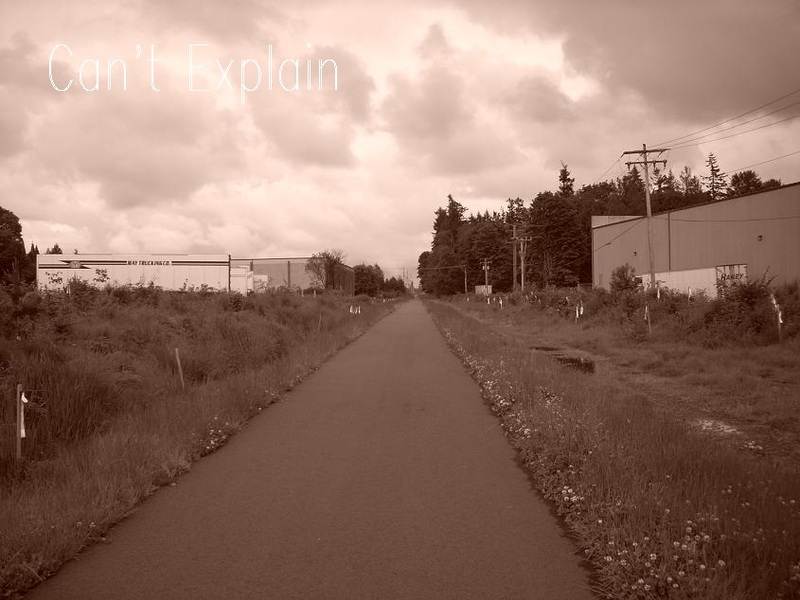 Want to write about random strange behavior? Put your main character out of his mind. Want to underline the pathos of someone's story? Consider housing them in a mental institution. Even better, make it clearly the wrong thing to do. At least Berriault hasn't made that mistake here. It's not clear the father doesn't warrant institutionalization. Certainly he is very depressed, and we know the assault happened. But he's such a maddeningly fuzzy character, as is his son, that it's hard to get any sense at all for who he or any of them are, let alone any reason to care. I'm willing to give Berriault some benefit of the doubt, because the story appears in good company in a good collection. But I think it's one of the lesser offerings. Breaking Away is an old movie now, going on 40 years, and it didn't have much that was new even at the time it came out. Still, it has real charm and that helps it overcome the obvious deficiencies, including those that come of just being so old. It's a sports movie, basically, an aspirational story set in a context of simmering class resentments, and there were plenty of contemporary movies like it: Rocky, Slap Shot, and The Bad News Bears (with an even younger Jackie Earle Haley) come immediately to mind, with Hoosiers still ahead. 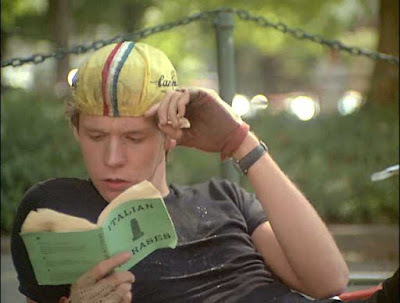 In Breaking Away, the specific sport is bicycle racing and the specific social conflict is between privileged students at Indiana University and "townies" from Bloomington, Indiana, lower-class locals who are shunned, mocked, and called "cutters" by the students because of the town's origins as a quarrying site. Stop me if you've heard this before. It's likely no coincidence a lot of this came along in the late '70s—a response to real economic trends, as it was the time, we know now, when income growth in the US definitively stalled at the lower ends of the scale and began to fall back, even as it went on to soar at the higher ends. In a year or two it would be known as "trickle-down economics," and then "Reaganomics." It's the Rust Belt when it was just beginning to show signs of rust. As such, it still has an amazing amount of poignancy. 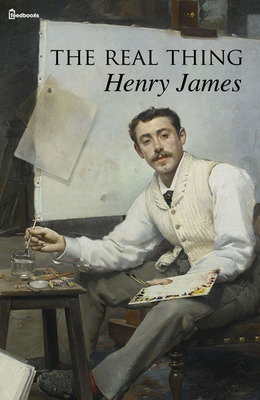 This story finds Henry James once again worrying ideas about reality and artifice in art. The unnamed first-person narrator is a portrait artist, as opposed to landscape. That's what one of his friends does, and because the divisions are all so clear and neat, one day the landscape artist sends along a curious pair of models to the portrait artist (having no need for them in his landscape work, you see). As it turns out, they are impoverished aristocracy—even the word "model" is beneath them. What strange world is this? Still, James appears to have his hands on something here. Not surprisingly, the aristocracy wins his grudging respect, even when they are in such arrears. Or perhaps because of it. Like Jesus and the Doobie Brothers, nobility is just all right with James. But he's also at pains to draw a line between professionals and amateurs. No matter what their origins, class, or taste, the models are to be pitied as amateurs—not "the real thing." The couple, of course, believe they are exactly that, as aristocracy. The narrator even believes it to an extent. But he has such better luck producing authentic work with models from the lower classes. Somehow he can't make it with this couple. "She was always a lady certainly," he writes of attempting to work with the woman, "and into the bargain always the same lady. She was the real thing, but always the same thing. There were moments when I was oppressed by the security of her confidence that she was the real thing. All her dealings with me and all her husband's were an implication that this was lucky for me." Which might be another way of saying, "The rich are different from you and me." I like to think the attitude was on the wane in Fitzgerald's time, but it's probably stronger than ever in our own, and certainly Henry James wasn't about to give it up in his time. But here he is nonetheless, grappling with what is real and what is not, with what looks like it should be yet somehow isn't, and vice versa. It doesn't surprise me that the aristocracy appears to have a bedrock of personal power that is mystifyingly empty when examined closely, but that's probably just because the world has moved along an inch or two. Nowadays it's engineers we believe can accomplish anything, fix anything, make anything do anything. We are bitterly disappointed when they can't (see the internet) but paradoxically that only seems to strengthen our faith. My point is that an engineer living the bum's life might be closer to our picture of what James means by "the real thing" here. He's taking on, even addled by his adoration of aristocracy, some of the most baffling mysteries of our lives, judging and assessing the appearance and character of others. In the end, our narrator the portrait artist is reduced to copying out points such as the cut of Major Monarch's trousers, or that "mathematically neat" trim of the back of Mrs. Monarch's hair. Yes, that's their name—Monarch. They aren't butterflies. If it's possible to name a movie that is a generic version of director Jean-Luc Godard's body of work, Pierrot le fou might be it. It's not in black and white (but neither is Contempt) and otherwise it has many of the signs: Jean-Paul Belmondo as a gangster-loving aesthete, Anna Karina as his beautiful disaffected girlfriend. Guns and cars all over the place. 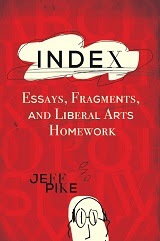 Arch and intellectual dialogue, encompassing multiple languages. Punctuations of images from great paintings and other cultural markers. Sound, image, and words which can all be at odds suddenly with one another, yet produce intriguing paradoxes of synchronicity—they work as montage, in other words. It loves Hollywood but hates America. It's full of literary and cinema references and it's playful beyond all reason. If you're not delighted you're only baffled, and that's OK too, seems to be the idea. If it's given me any new insight into Godard, it's the degree to which he's shambolic, like a drunken rock band that turns to playing covers of pop songs others claim they would rather forget. This loose and freewheeling sloppiness may be Godard's single greatest charm, reflecting some kind of opposition to professionalism as inhuman, perhaps, as mere artifact of capitalism and Coca-Cola marketing, as he might put it. But it's a deliberate choice on his part, because it's obvious from the images he casually sows through all his films, this one no less than any others, that he's a gifted visualist. As a filmmaker, he's a natural. 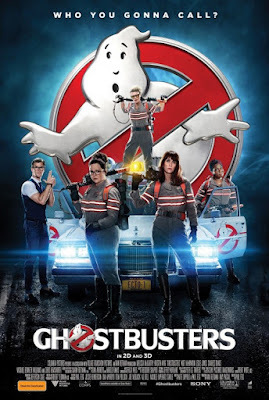 I'm not sure anyone thought it was a good idea to remake Ghostbusters, but now that it's done I finally thought I'd give it a look. Recall that the original 1984 Ghostbusters was not actually that good. A lot of the principals—Dan Aykroyd, Bill Murray, Harold Ramis, and Ivan Reitman—were riding some serious mojo and high expectations from recent hits (The Blues Brothers, Caddyshack, Stripes, Trading Places, etc.). And a lot of money went into it. And it was filmed in New York City on location. Cha-ching! It was all so amiable nobody seemed to care that it wasn't that funny, except in a few places, most of them covered in the trailers. Yet it somehow blew up so big that along about the time of its release in June 1984 it seemed everywhere you looked it was either "When Doves Cry" or Ghostbusters ("who you gonna call"). As a reboot / remake / whatever, doing the 21st-century thing of switching up the gender roles, it's basically fine. In fact, it's likely the new one is more funny, for a few reasons. Kristen Wiig remains a good bet for comedy these days, much like Bill Murray all those years ago. She's got a natural style. Melissa McCarthy and Leslie Jones are also solid, with their own bits. But the show mostly belongs to Kate McKinnon, whose performance looks like a matter of stitching together inspired improv notes that go zinging and zanging off the hard surfaces of the rest of the movie. Sometimes it's purely the surprise that gets the laugh, which is a good trick. Otherwise, it looks a lot like the same game plan: lots of money for special effects and filmed on location in New York City. There's a kind of "himbo" who is hired to the paranormal project as a receptionist. That's Chris Hemsworth, the God of Thunder, and he never really manages to figure out the phones. As with the original, the new one abandons much of the comedy in the second half, going to lots of very big action scenes in the streets, with things blowing up, etc. There's a pretty good scene at a metal show. There are also some fun cameos, some of which go by fast: Dan Aykroyd, Bill Murray, Al Roker, Sigourney Weaver, and more. For what it's worth, I noticed as I was leaving that most of the smallish crowd that day for a movie released more than a month earlier were women. But then, they are usually the majority at most of these Tuesday morning matinees, so don't make too much of it. 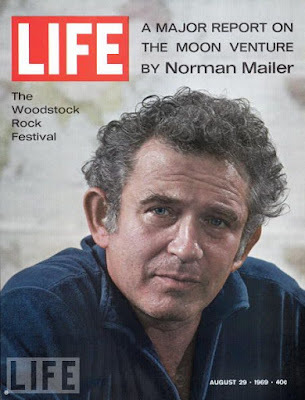 Norman Mailer sounds a little tired and depressed in this one, likely because his fourth marriage was ending as he worked on it, which he discusses in passing toward the end. Somehow this book had seemed daunting to me for many years, but, finally getting to it, it turns out to be a mostly interesting if rather long curiosity. I found out, among other things, that Mailer studied aeronautical engineering as a college undergraduate. He thus seems to know enough to grasp and communicate the dangerous technological feat in 1969 of "landing a man on the moon and returning him safely to the earth." 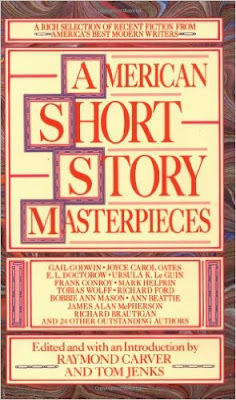 For this book he has christened his narrative voice "Aquarius" (much as he has formerly been "The Novelist," "The Historian," just plain "Mailer," etc.). First he rushes through the press events surrounding it, and then backs up and goes over the whole mission again, more slowly, grinding on the technology. His description of the rocketry going on at takeoff is epic. I especially appreciate the sections when he goes into "the psychology of machines," on which, of course, the whole venture hinged. On some level, knowing what we know about Mailer, what he has freely disclosed, I suspect a good deal of the glum air could also be envy working out. It certainly feels feeble when he compares understanding rocket science to understanding James Joyce's Finnegans Wake. It seems incredible to me now that this thing happened—actually, it is literally incredible now to a certain species of truther, which only makes me sad. Mailer's painstaking guide from takeoff to splashdown takes up the bulk of the book, and if it's tinted some by a weird emotional overlay, it's still really excellent reportage on how much was new and unknown on this mission, how precarious the whole thing was. He veers off on personal tangents, but for once his heart rarely feels in them, and so he tends to return quickly again to the mission and the astronauts, plumbing every point that occurs to him. Is it fair to discuss it with Tom Wolfe's The Right Stuff? Sure. Wolfe's book may be the better one on the U.S. space program generally, but Mailer covers that pretty well and is also much better on what space travel is like—what it is based on, where the dangers and unknowns are likely to be found, and the sheer old-fashioned adventure of it buried under the PR hoopla and governmental maneuvering for funding. This one never follows through on the wit of the "Aquarius" moniker, but Mailer is journalist enough to let the facts tell the story when he's got nothing else.